The following sections provide information on functionality common to all ProEssentials components. All ProEssentials charting components have access to the Export Dialog via right clicking chart or pressing X key. See AllowExporting. The MetaFile format is a good method to export the components image. ProEssentials metafile exports are true vector renderings and the metafile will be able to adapt to varying output resolutions. However, since the image has textual attributes, the image should not be stretched or squeezed. If so, the text will also be stretched or squeezed. If re-sizing, be sure to maintain the length to width aspect ratio. WMF is an older format with best support. EMF attempts to support bitmaps and gradients and rasterization plus resolution independence but usually a PNG or JPG format is best to support exporting charts with gradients. The BMP format is the most common image export format, however, it uses a large amount of memory and doesnt necessarily take advantage of high resolution printers. Similar to the Bitmap format, the JPEG format is compressed to take less memory but still doesnt take advantage of high resolution printers. This format is widely used on web pages. This format is best suited for photographs because line art will be fuzzy. A better format for line art is the PNG. Similar to the Bitmap format, the PNG format is compressed to take less memory but still doesnt take advantage of high resolution printers. This format is gaining use on web pages and is most similar to the GIF format. This format will produce the best looking compressed raster images. Similar to the Metafile format, image is vector based, modern browsers have grown great support for display and Internet Explorer and Chrome also have very good printing support. Best to set RenderEngine to Hybrid while exporting SVGs if you want to preserve 100% vector to the printed page. Alpha content can cause some printer drivers to rasterize the image. When the Text / Data Only format is selected and the user presses the Export button, a Text / Data Export Dialog is invoked. The Text / Data Export Dialog allows the components information to be exported in a variety of ways. The user selects the desired data and whether or not to include labels. 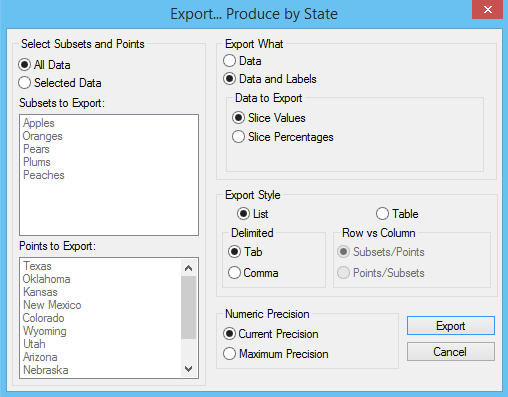 The Data to Export section will change depending upon the component. The user then chooses either a Table or List style and output precision. The text export dialog is a useful tool for the developer as well as the end-user. If you are having trouble programmatically passing data into the component, you can use this export dialog to export the data into Notepad to verify what is currently inside the ProEssentials component. Its best to export in a List Style with Maximum Precision. This will usually shed light on the problem and allow you to adjust your logic to properly pass the data into ProEssentials. If you are having trouble passing data, please use this tip before calling for technical support. Our support staff will likely ask you to try this approach to resolve the problem. The ClipBoard will be the most common destination. It provides a quick method of sharing information with other Windows applications. When exporting to a File, the user must supply a filename via a SaveAs File Dialog. It is not shown because it is a standard SaveAs Dialog. 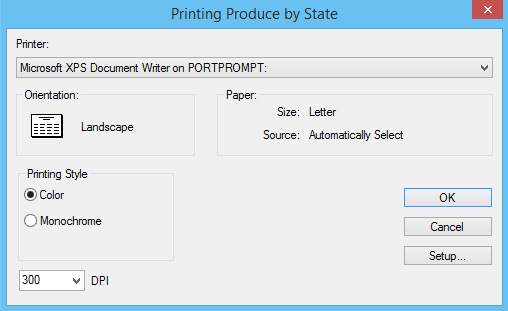 When the Printer destination is selected and the user presses the Print button, a Print Dialog is invoked. The Print Dialog allows the user to select a printer, adjust printer setup, and if the component has a vertical scrollbar, allows the user to adjust Scrolling Subsets Print Options. The Scrolling Subsets Print Options enables the user to export multiple pages. The component is automatically scrolled one page at a time, and each page is in turn sent to the printer. See the various chapters for specific printing documentation per programmatic interface. Or see PEprintgraph. 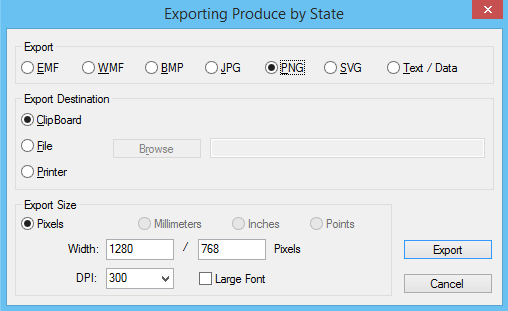 The Export Size section changes depending on the Format and Destination selected. When exporting a Bitmap, JPEG or PNG, the only unit size available is pixels. When exporting to the Printer, No Specific Size changes to Full Page. When exporting Text / Data, the Size section is hidden. When exporting images, the DPI setting is only applied if the Large Font selection is checked. Exporting at 100 DPI is good for images destine to the screen. 300 DPI is best when image may need to be printed. All ProEssentials components have maximization capabilities. Maximization is the process of copying the component into a modal dialog box enlarged to fit the screen. When the user is finished working with the maximized version, they can click the title bar or press Esc to return to the normal sized component. See AllowMaximization. The Maximization mechanism creates a copy of the component and maximizes this copy. This allows the underlying control to still receive data in a real-time data monitoring application. However, this also means that there is no DataHotSpot feedback between the maximized component and your program. To maintain DataHotSpot feedback, you will have to maximize the actual component by adjusting the Width and Height properties for VB/Delphi developers or via the MoveWindow API if you are a C/C++ developer. All ProEssentials Dialogs have Help buttons which access "PEGRAPHS.HLP". This help file contains end-user information about the use of ProEssentials components. It's pretty basic so we disable this option by default. The property HelpFileName allows the developer to change the file which gets opened when the user selects a ProEssentials Help button or menu item and is the best use for enabling the Help user interface option. ProEssentials components respond to the mouse as follows. Right-Button Single-Clicking invokes a popup menu. Left-Button Double-Clicking will show the customization dialog. 3D Scientific Graph components will auto-rotate upon Double-Clicking. Left-Button Single-Clicking will give the component the input focus. If user clicks on a hot-spot, the corresponding event or notification message will be invoked. Left-Button can be used to control scrollbars. Switches between monochrome and color viewing styles. Toggles between custom and original parameters. Maximizes the component to fit the screen. Shows the Text/Data export dialog. Scrolls both vertical and horizontal scrollbars by one line. Pages horizontal scrollbar to the right. Pages horizontal scrollbar to the left. Moves vertical scrollbar to its first position. Moves vertical scrollbar to its last position. Moves horizontal scrollbar to its left-most position. Moves horizontal scrollbar to its right-most position. Built-in menus and dialog tabs can be disabled if needed. There is also a mechanism to add your own menu items if needed. See CustomMenuText. Also see Common Question 38. Within the demo, see example 127. AllowUserInterface can be used to disable all mouse and keyboard interfaces or just the mouse or just the keyboard portions.